've learned that pelmeni is a dish with meat. 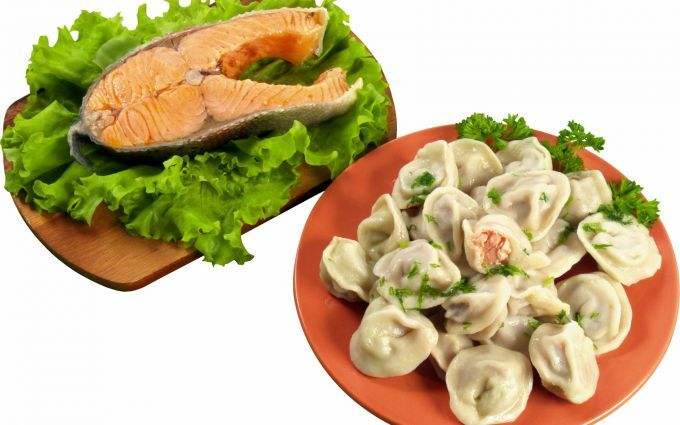 But for variety, you can cook dumplings with salmon and they did not give meat to their brethren in taste. Fresh salmon is thoroughly rinsed in cold water, cleaned of scales and entrails, cut off the fins. The flesh separated from the bones, then mince, adding fresh fat. In the resulting mince add the spices and salt. Onions and garlic peel from the husk and grind in a blender or food processor. Dill finely chop. Onion, garlic and fennel also add to the mince and knead well for him. Beat eggs in a wide capacity and whisk, then season with salt and add water. Mix well. To the mixture add the flour and start kneading the dough it should not stick to hands, but at the same time to be flexible. Kneaded the dough to give a little rest. For the formation of dumplings from dough to cut a small piece and roll it sausage. Then sausages cut equal size pieces, roll in flour and roll out with a rolling pin until small size of lepeshechki. On each tortilla put the stuffing of salmon and to form the dumplings, well wrapped edges. Dumplings cook in boiling water with a Bay leaf and black pepper. When the dumplings float, cover need to open and cook the ravioli until tender with the lid open. Serve dumplings with sour cream or butter, sprinkle with chopped dill.